A Harvard study noted attendance dropped from 79% at the beginning of the year to 43% at semester’s end. At Harvard, where tuition and housing costs some $70,000 a year, each missed class amounts to several hundred dollars. More than 20% start cutting class from the get-go … and by the end of the semester, a majority are cutting class. A couple of common suspects: (a) attendance isn’’t mandatory; (b) the material is available online; (c) the material won’t be on a test or required to complete assignments; (d) the class is flat out boring. That not withstanding, the author argues that students should attend classes any way because (a) they (i.e. their parents) have paid a lot for the opportunity to attend classes (several hundred dollars of tuition per class session); (b) there are health benefits to maintaining a schedule and maintaining social contacts; and (c) there’s at least some chance that the prof will clarify material or facilitate fruitful discussion. What can schools (and teachers) do to motivate students to attend class? Trust me, the answer isn’t making classes mandatory and taking attendance. There’s nothing worse than facing a roomful of students who don’t want to be be there — regardless of their reason. First, schools should keep classes relatively small. There’s no meaningful difference between a live lecture to one or two hundred students and an online lecture … so, put it online. If you want meaningful discussion, keep the class size under, say, 40 students so that each student has a realistic chance to participate … and no place to hide from prof’s cold calls. Second, profs should accept responsibility for making their classes worthwhile. That means making classes as engaging as possible … fast-paced, content heavy … always with a clear, evident purpose. The ‘purpose’ might be (a) to provide a contextual background; (b) to build a fundamental skill (e.g. how to do a particular kind of analysis(; (c) to clarify (or simplify) complex material; or (d) to showcase material that will will be useful immediately for completing assignments or answering test questions. 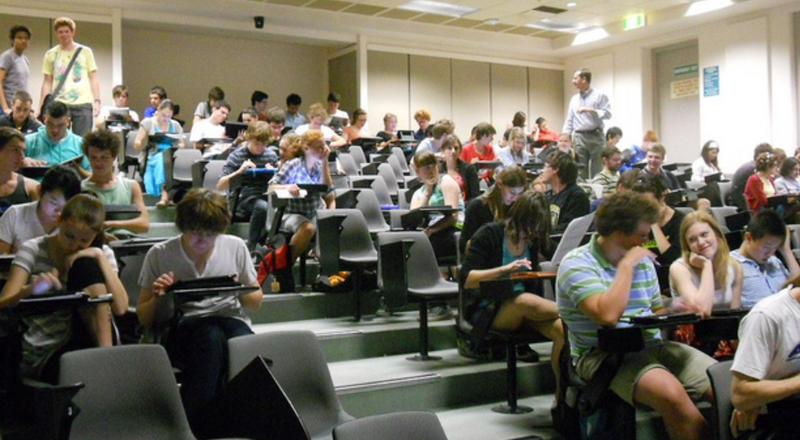 If students still don’t think that it’s worth coming to class … so be it! This entry was posted on August 31, 2018 at 6:56 am and is filed under Education - Academics, Teaching methods, Teaching philopophy. You can follow any responses to this entry through the RSS 2.0 feed. You can leave a response, or trackback from your own site.